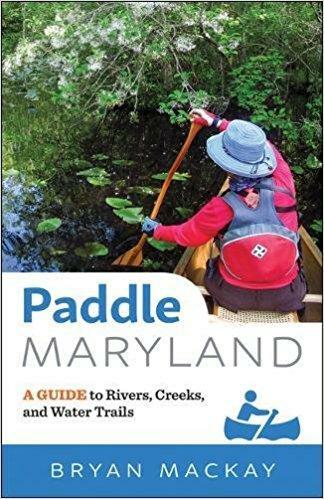 The cover of "Paddle Maryland." After a spring of wretched downpours and cold, cloudy weather, summer has finally begun -- at least unofficially -- and the bullfrogs are singing its praise. I slide my kayak into the lake at Tuckahoe State Park on Maryland’s Eastern Shore. It’s a sunny, breezy afternoon, and the lake is fringed by swaying reeds and the arrow-shaped leaves of water plants -- called Tuckahoe – whose roots were an important source of food for Native Americans. As I paddle along the edge of the lake, three painted turtles sunning themselves on a log plunk down into the water. Dragonflies flit over the surface. A leaf drifts down into the lake, and as it lands, its curled backside stretches up from the water like the sail of a boat. My trip is a prelude to the joys of summer. And what brought me here was a new book called Paddle Maryland by University of Maryland, Baltimore County biologist Bryan McKay. Johns Hopkins University Press this spring actually published three guidebooks by McKay, each of which is a treasure troves of ideas for weekend adventures. The other two are titled Hike Maryland and Cycle Maryland. I highly recommend them for anyone who loves to get outside for the weekend. You can find them at the Ivy Bookstore in north Baltimore; Trov in Hampden; Barnes and Noble –and at many other local and online book sellers. What makes these books useful is that they provide detailed maps, descriptions, and exact starting and ending places for day trips. For example, Paddle Maryland gave me both the address and GPS coordinates for the boat ramp at Tuckahoe State Park. Among the favorite places of mine highlighted in the book is the scenic rocky streamside trek of the Gunpowder South Hiking Trail in Baltimore County. Cycle Maryland recommends biking and camping along the 185 mile long Chesapeake and Ohio Canal towpath along the Potomac River in Western Maryland. This is a wonderful place to escape in the sweltering days of July or August, because the bike path is shaded by a vault of trees. I enjoy combining cycling and kayaking along the path near the historic battlefields at Antietam, paddling downstream and then biking back to my car. The author, McKay, has personally tested out and previews trips of varying lengths at these locations; and he describes in detail the wildlife you are likely to see. For example, on Tuckahoe Creek, he told me in advance to expect the swamp roses with pink flowers; the silky dogwood; and the giant beaver dam and its inhabitant. At one point in my kayak trip, after I passed a stand of sweetgum trees, I heard a rustle in the marsh grasses, and a loud splash. It was then that I saw the beaver, with its wide brown head, swimming toward me between tufts of Tuckahoe. I was delighted to see it because beaver were almost eradicated from Maryland in the 19th century and have been making an encouraging comeback. But the beaver was not as delighted to see me, as it ducked beneath the water and vanished, just as the sun was setting, painting the skies orange behind the shady shapes of the willow trees.